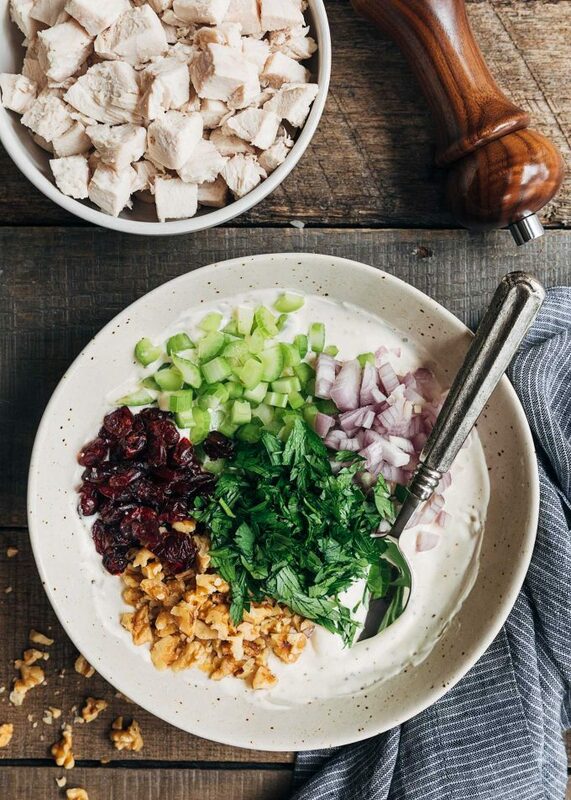 This Cranberry Chicken Salad with toasted walnuts is a delicious fall twist on a classic. It’s easy to make (and make ahead) for lunch on an autumn afternoon. Like most classic recipes, I find that chicken salad can be such a personal thing. Some like it very simply prepared, others like it packed with different flavors and textures that range from savory to sweet. 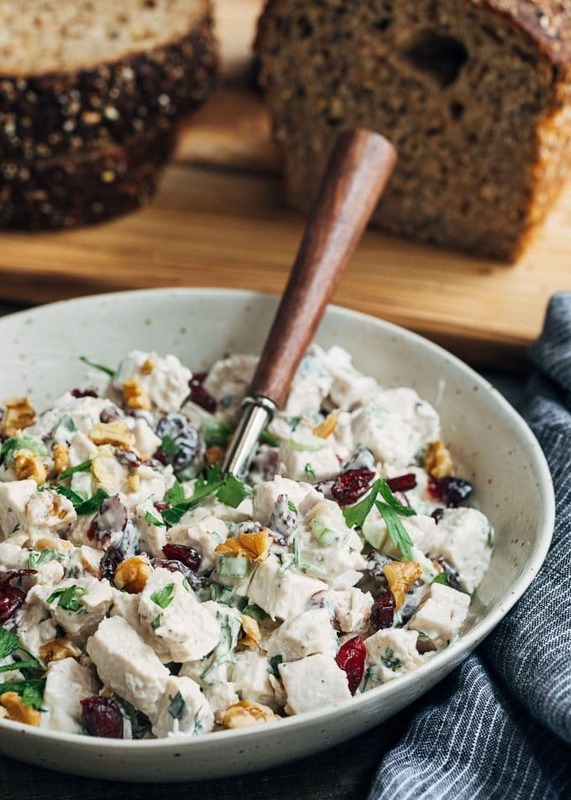 My Cranberry Chicken Salad falls in the latter category; tender, juicy chicken with a creamy dressing, crunchy celery and walnuts, and a pop of sweet-tart dried cranberries (craisins). It’s one of my favorite autumn lunches. I developed this cranberry chicken salad from my family recipe for Classic Chicken Salad with Tarragon. The classic recipe has been a springtime favorite for as long as I can remember. It only needed a few modifications to become a fall staple in our house! Our family’s chicken salad adds a touch of sour cream to the traditional mayonnaise base. It lightens the dressing a bit and makes the salad nice and creamy. 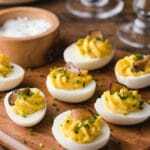 Dijon and lemon juice are musts to brighten the flavor, and classic additions of chopped shallot or red onion and celery add crunch. What Kind of Chicken Should I Use to Make Cranberry Chicken Salad? I love to make chicken salad with poached chicken breasts. 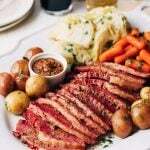 They’re easy to prepare and the meat is so tender, flavorful, and juicy. 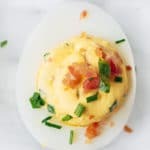 Plus, you can poach it ahead of time, and have it ready in the refrigerator a few days before you want to make your salad. I’ve also made this recipe with store bought rotisserie chicken, or oven-roasted chicken leftover from dinner. Roasted breast meat can be a little less juicy than poached, but it works tossed with the dressing. 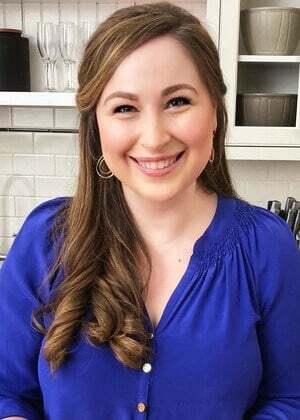 I also find that store bought rotisserie chickens vary quite widely in terms of their salt content, so be mindful of that when seasoning the chicken salad. Always best to salt to taste! Whether you’re using poached or roasted chicken, cut it into about a 1/2- to 3/4-inch dice. I like my chicken salad to have nice-sized, meaty chunks of chicken, but still be manageable to eat on a sandwich without a fork. 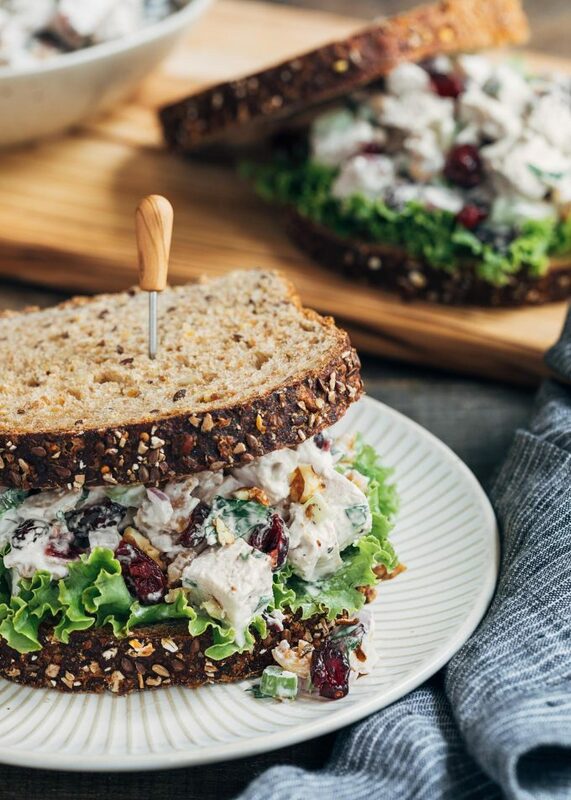 We love to make sandwiches out of this Cranberry Chicken Salad, served on a hearty 4-grain bread, as shown in the photos. The nutty, toasty quality of the grain bread pairs so well with the sweet-tart cranberries and the walnuts in this recipe. I also can’t resist a scoop of this salad on lightly-toasted farmhouse bread or a buttery croissant. If you like, you can also make a wrap out of these with your favorite tortilla—whole wheat would be great! I also like it with club crackers or crispbreads. For a lower carb alternative, the salad is also delicious served in a lettuce cup or wrap, or honestly, just in a bowl with a fork! 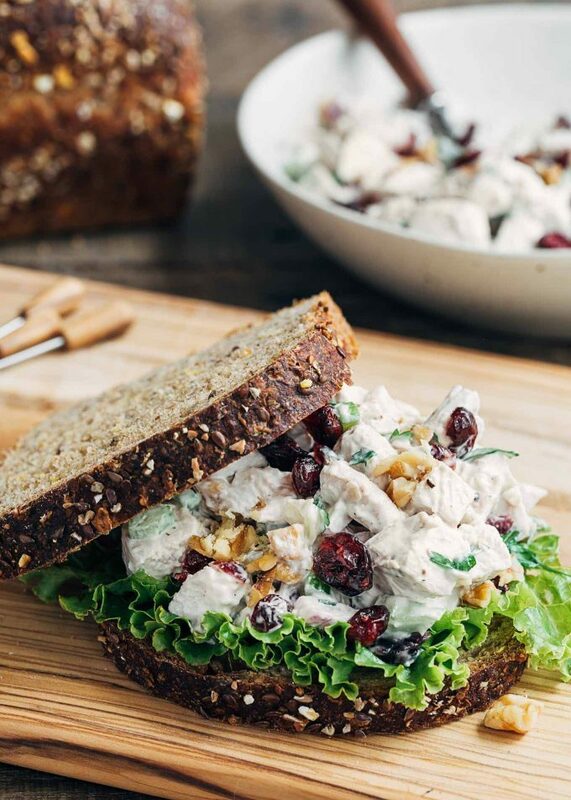 One of the best parts about this chicken salad recipe with cranberries is that you can make it a few days ahead for an easy fall lunch. The salad will last for 3-5 days from when the chicken is cooked, stored tightly-covered in the refrigerator. If you’re making it the day you eat it, keep in mind that the salad does have to chill in the refrigerator for an hour before serving. 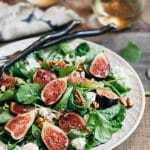 This allows the flavors of the dressing to soak into the chicken a bit and meld everything together into a perfectly-textured, irresistible salad. 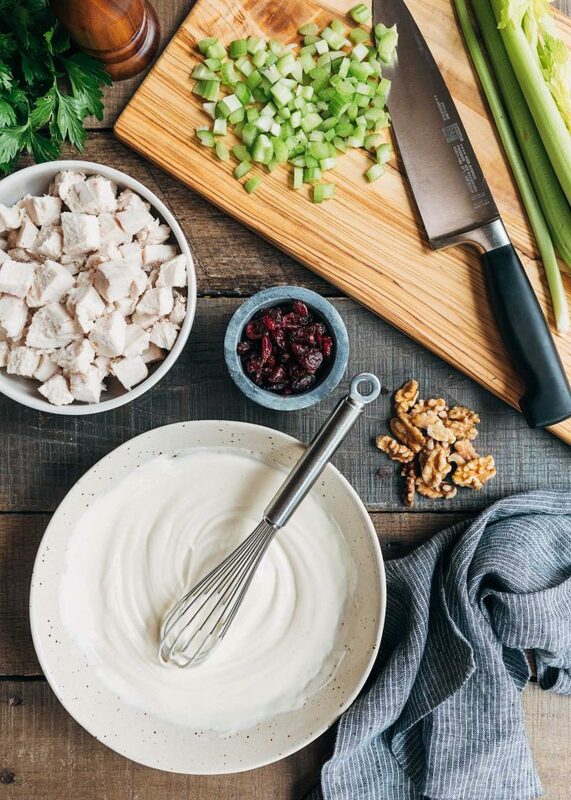 This creamy, crunchy chicken salad adds sweet-tart dried cranberries and toasted walnuts to a classic recipe for a delicious fall lunch. For convenience, you can poach the chicken breasts ahead or use leftover rotisserie chicken as well! 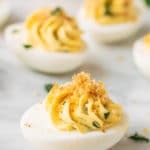 In a medium bowl, whisk together mayonnaise, sour cream, Dijon mustard, lemon juice, salt, and pepper. Stir in celery, red onion, cranberries, walnuts, and parsley. Fold in cubed chicken. 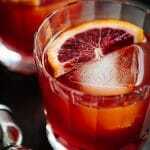 Cover and refrigerate for at least 1 hour for the flavors to meld. Season to taste with additional salt and pepper before serving. We like this chicken salad best on 4-grain bread, lightly-toasted farmhouse white, or croissants. Place 2-3 boneless, skinless chicken breasts in a pot in a single layer. Sprinkle with 1/2 teaspoon kosher salt. 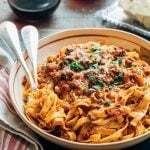 Add about 1 teaspoon whole peppercorns and some aromatics to the pot, such as 1-2 garlic cloves, a few sprigs of fresh herbs like parsley, dill, and thyme, and a dried bay leaf. Add enough water to cover the chicken by about 1 inch. Bring to a boil, cover, and reduce heat to maintain a simmer. You may see a white foamy substance in the pot as the chicken breasts cook; this is normal, you can either skim it away or leave it alone. Simmer until the chicken breasts register 165 degrees F at the thickest portion. This will take anywhere from 5-14 minutes, depending on the size of the chicken breasts. Store poached chicken breasts, tightly covered, in the refrigerator for up to 3-4 days. This chicken salad can be covered and stored in the refrigerator for 3-4 days from when the chicken was cooked. The chicken will absorb some of the dressing as the salad sits overnight. I like to make a little extra dressing to hold on the side and toss with the chicken salad, as needed, if I'm serving it the next day. Thanks I made some and it’s a hit. This sandwich looks amazing. Thanks for the tutorial on poaching chicken….I have never tried to do it before. So simple. 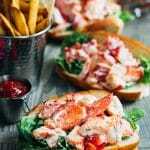 I’m looking forward to perfecting these before thanksgiving because I think this would be a perfect sammie to help use up the leftover turkey. I’m inspired. What a great sandwich!! All of the ingredients combine to make a perfect filling. My mouth is watering just looking at the photos. I like the addition of the cranberries plus the toasted walnuts. This screams Fall flavors and I’m pinning right now. Most gorgeous chicken salad ever!! 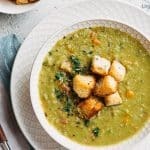 My stomach seriously growled looking at these photos! I am always in the mood for chicken salad, but even better when it has cranberries in it… Delicious! I love how this has cranberries and walnuts. Those are two of my favorites in a chicken salad. The sour cream is a great idea! 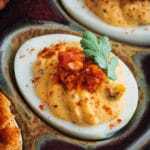 I’m thinking of using leftover turkey with this too after thanksgiving! I was drooooling when I saw this on IG! 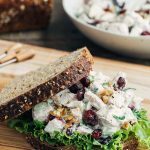 This chicken salad looks amazing – we always have leftover cranberries after Thanksgiving so this is perfect! I haven’t had chicken salad in so long that I think I’m going to have to make some ASAP. Thanks for the inspo! Welp, I know this recipe uses chicken, but you’ve just inspired me to take my post-thanksgiving turkey sandwiches to a whole new level. I love the burst of sweetness from the cranberries. It works *so* well. I think I can appreciate chicken made simple and amped up, like with this recipe, but I definitely prefer the latter. When you can have this much fun with a lean protein, why not do it. This chicken salad is so good! I put it on a croissant and am having the leftovers again for lunch today. I’ve had chicken salad with grapes in the summer and the cranberries are even better for fall! 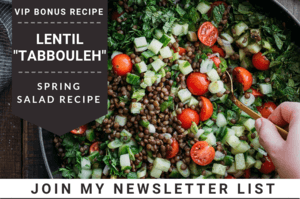 I made this for dinner tonight after drooling over it on Instagram and it is a TOTAL winner! What a great chicken salad recipe!! Will make again and again this fall thank you. I love chicken salad sandwiches. This looks like a winner here. All those textures and flavours. Perfect for lunch or dinner….even for brunch. The colours look amazing. The hardest part would be picking the PERFECT bread. What a great way to use leftover turkey too. You just made me so hungry! This looks like the most perfect chicken salad ever– I love that touch of sweet from the craisins. And I never thought about adding sour cream to the mayo! I wish this was my lunch today!